I had the opportunity to try a new Indie polish and I must say I'm so glad I did. This polish is gorgeous. Cadillacquer polishes are made in Swtizerland. The formula on each of these polishes was wonderful. They are easy to apply and were opaque in two coats. Slice of Life - is a bright red jelly base with blue sparkles. This gorgeous polish shimmers and shines with flashes of pink and blue. It is stunning! This is two coats with a top coat of Seche Vite. No Place Like Home - is a soft pastel white base polish with different colored fine flakies and pastel pink, blue, green and yellow glitter. This polish makes me think of a polished slab of gray granite. It also reminds me of a fine pressed linen paper. The subtle glitters and flakes add a depth that is mesmerizing. This is two coats with a top coat of Seche Vite. Cadillacquer polishes are 3 free and cruelty free. 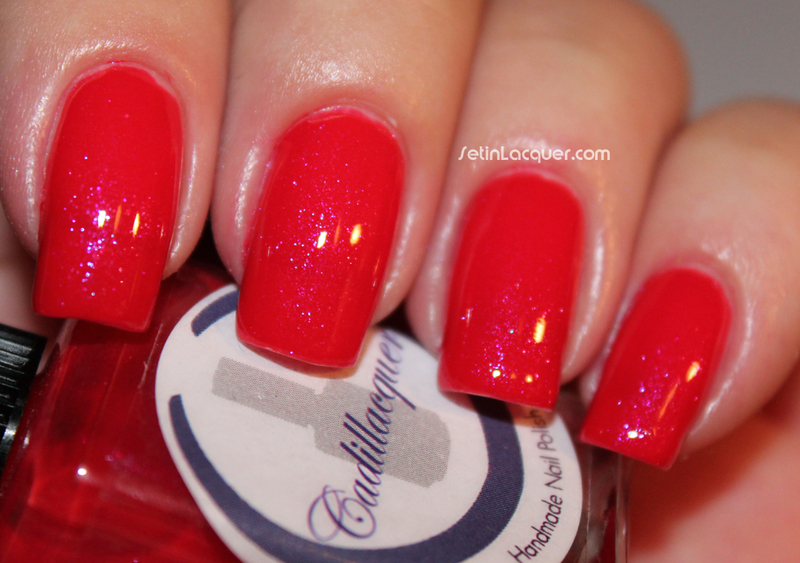 You can get Cadillacquer polishes from her Etsy site (but remember it ships from Switzerland) or from Llarowe. Llarowe is a one-stop shopping site for those hard to find indie and international polishes. Make sure to follow Llarowe on Facebook to keep up with the current releases and new polishes.